Thankfully sushi is not a particularly fattening food, and a low calorie meal is not out of the cards if you have a craving for sushi. While the rice in sushi contains a fair amount of carbohydrates, sushi can be eaten without rice (as sashimi) and in moderation, even a standard sushi item can be a healthy treat without breaking the calorie bank. 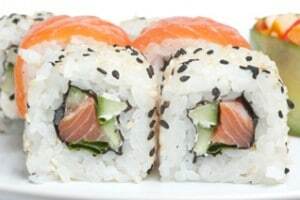 In this section we highlight the the calories in sushi and the nutritional values for common sushi items you will likely find in your sushi dining adventures. We have collected information on nigiri sushi (finger sushi), maki sushi (rolls), sashimi, side items you may find at a Japanese restaurant, and even items that are commonly found at grocery stores like Whole Foods. We hope that this information will help you make informed decisions. If you like green tea, visit Japanese Green Tea and use the code “faq” for a 10% discount! At an average restaurant, the neta, or fish part of a sushi item will weigh roughly 0.5 oz, while a piece of sashimi will weigh approximately 1 oz, depending on who prepares the fish. At an average restaurant, the neta, or top part (e.g. fish) of a sushi item will weigh roughly 0.5 oz, while a piece of sashimi will weigh approximately 1 oz, depending on who prepares the fish. 3 A typical serving of ankimo will be 1.5 ounces. Hover your mouse here for full serving nutritional information and source. N.B. Sashimi is also a particularly good choice for those on low carb diets due the high protein, low carbohydrate profile of many fish. 4 These values were provided by Genji Express, the company that produces the sushi for Whole Foods in many of their stores. Before assuming that these values will exactly match your purchase, please ensure that the sushi you purchase from Whole Foods was produced by Genji Express. Also keep in mind that these values are per 100g, not per package, unless otherwise indicated. We caution our readers that as with any hand-crafted food, a similar sushi item made by two different sushi chefs may have different proportions of ingredients, and therefore different values for calories, fat, carbohydrates, and protein. Restaurants may also add ingredients, such as mayonnaise, to some rolls which will increase their caloric values over our baseline data. However, the information in this section should give you a good approximation of the calorie and nutritional content of various sushi items in order to make an informed decision regarding the weight loss advantages of lean protein and sushi in general. Please keep in mind that we at The Sushi FAQ are not nutritionists or dietitians. We have simply compiled data from official sources (e.g. the USDA) and data from restaurants and supermarkets in order to provide our readers with a single source of accurate numbers. By popular demand for a Weight Watchers PointsPlus list, we have added estimated Weight Watchers points for sushi items (usually rounded to the nearest half point) calculated from the nutritional values provided. Meshi agare!